Let the elegance and grace of a wedding ceremony continue through your creations using our Nuptials Collection! Create stunning wedding invitations, gorgeous wedding planners or memorable scrapbook wedding albums for the special bride and groom. 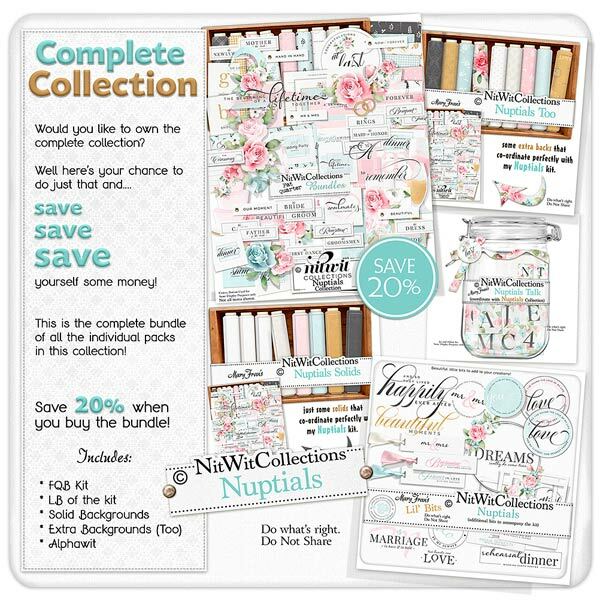 Contained in this digital kit you will find so many unique background papers and elements from cards for the bride and groom, digital stamps to enhance any background paper or area with the perfect memory and labels galore that have the perfect sentiments for your wedding invitations or scrapbook albums. Show them how much you truly appreciate the new couple by creating from your heart. Visit our Pinterest Inspiration Gallery for larger photos and more ideas!